When there is an increase in the volume of the tissue behind the eyes, the eyes will appear to bulge out of the face. The terms exophthalmos and proptosis apply. Proptosis can refer to any organ that is displaced forward, while exophthalmos refers just to the eyes. The eye socket (orbit) is made of bone and therefore will not yield to increased pressure within it. Only forward displacement of the eyeball (globe) will allow more room if tissue behind the eye is increasing. 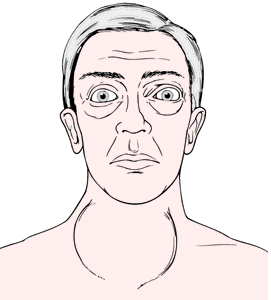 The most common cause of exophthalmos is Graves' disease, overactivity of the thyroid gland. The contents of the orbits swell due to inflammation, forcing the eyes forward. The inflammation affects primarily the muscles. This combination of muscle impairment and forward displacement reduces eye movement, causing double vision and crossed eyes (strabismus). The optic nerves can also be affected, reducing vision, and the clear membrane (conjunctiva) covering the white part of the eyes and lining the inside of the eyelids can swell. Finally, the eyes may protrude so far that the eyelids cannot close over them, leading to corneal damage. Exophthalmos from Graves' disease is bilateral (occurring on both sides), but not necessarily symmetrical. In contrast, exophthalmos from orbital tumors or a blood clot in the brain happens on only one side. Exophthalmos is obvious when it is advanced enough to cause complications. When there is doubt in the early stages, a mechanical device called an exophthalmometer can measure the protrusion. Computed tomography scans (CT scans) are of great value in examining the bony components of the orbit. Magnetic resonance imaging (MRI) scanning is equally valuable for displaying the contents of the orbit, because it "sees through" the bone. If a tumor is growing behind the eye, it needs to be removed. If Graves' disease is the cause, it may subside with treatment of the overactive thyroid, but this is not guaranteed. Local care to the front of the eye to keep it moist is necessary if the eyelid cannot close. Exophthalmos can be progressive. Its progress must be carefully followed, treating complications as they occur. Vision can usually be preserved with attentive treatment. There is currently no way to prevent any of the underlying conditions that lead to exophthalmos. Conjunctivae — The clear membranes that line the inside of the eyelids and cover the white part (sclera) of the eyeballs. Cornea — The clear, dome-shaped part of the front of the eye, through which light first enters the eye. It is located in front of the colored part of the eye (iris). Inflammation — The body's reaction to invasion by foreign matter, particularly infection. The result is swelling and redness from an increase in water and blood, and pain from the chemical activity of the reaction. Strabismus — Any deviation of the eyes from a common direction. Commonly called a turned eye. Thyroid — A gland in the neck overlying the windpipe that regulates the speed of metabolic processes by producing a hormone, thyroxin. abnormal protrusion of the eye. adj., adj exophthal´mic. It results in a marked stare and is usually due to hyperthyroidism. Occasionally the condition is caused by an infection of the eye or a tumor behind the eye. Exophthalmos and goiter in Graves' disease. From Frazier et al., 2000. Protrusion of one or both eyeballs; can be congenital and familial, or due to pathology, such as a retroorbital tumor (usually unilateral) or thyroid disease (usually bilateral). Protrusion of an eyeball. This forces the eyelids apart and causes a staring appearance. Exophthalmos is caused by an increase in the bulk of the contents of the bony eye socket (ORBIT) from any cause. The commonest cause is an immunological disorder associated with the thyroid gland, but exophthalmos, or proptosis, may be caused by tumour, bleeding or a mucous cyst from a sinus (MUCOCOELE). Abnormal protrusion of the eyeball(s) from the orbit, caused by Graves' ophthalmopathy, endocrine malfunction, paralysis of the extraocular muscles, injury of the orbit, cavernous sinus thrombosis or a tumour behind the eye. The palpebral fissure is usually wider and a rim of sclera may be visible above and below the cornea (Fig. E7). Unilateral displacement is usually referred to as proptosis. See pathological diplopia; Graves' disease; elephantiasis oculi; enophthalmos; Apert's syndrome; Crouzon's syndrome. Protrusion of one or both eyeballs; can be congenital and familial, or due to pathology. n an abnormal protrusion of the eyeball. It is characteristic of toxic (exophthalmic) goiter. abnormal protrusion of the eye. seen in brachycephalic breeds with shallow orbits; see also euryblepharon. exophthalmos with strabismus is inherited in cattle. inability to move the eye because of exophthalmos. due to an arteriovenous fistula of the orbit.